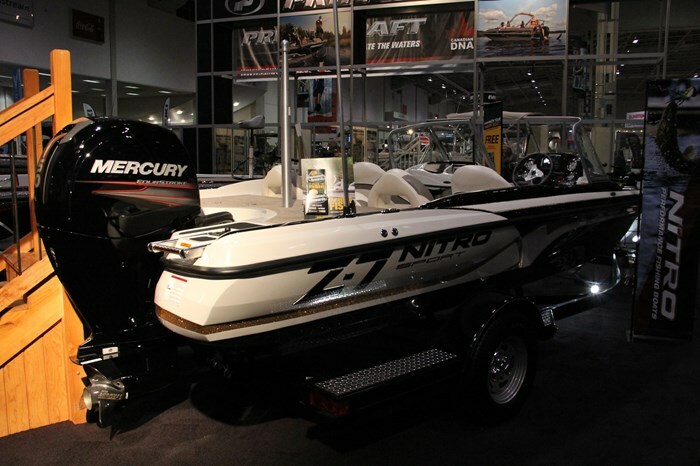 As part of the Bass Pro Shops/Tracker Marine Group family which includes Tracker, SunTracker, Mako, Tahoe, Regency, and Ascend, NITRO® boats of Springfield, Missouri, for 2015 offers nine models of what it refers to as “Elite fishing machines” in three series ranging from seventeen to twenty-one feet. 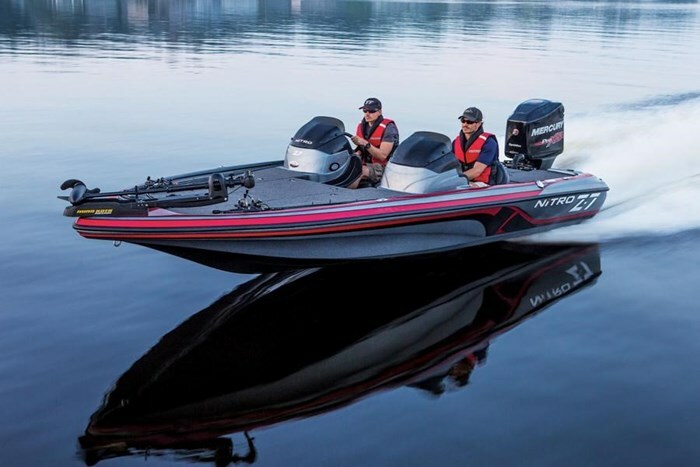 It’s important not to confuse this Nitro Z-7 Sport with the Nitro Z-7 which itself is part of the six model Z-Series of dedicated bass boats. 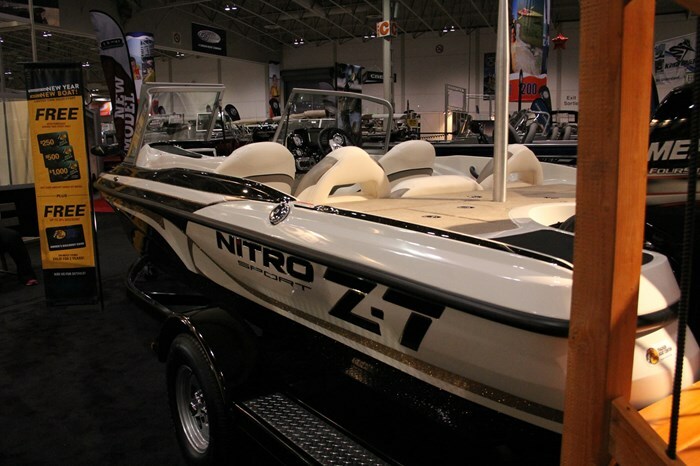 The Z-7 Sport is the only model in Nitro’s Sport Series and is different not only in length, beam, interior depth and other measurements from the Z-7, but the Z-7 Sport is intended not only as a serious fishing machine, which it is, but also as an ideal boat for family watersports and all-round enjoyment. The first thing you will notice about the Z-7 Sport is that it doesn’t have the typical interior layout of a dedicated bass boat with their massive bow and stern casting decks flush with the gunnels and their normal cockpit layout of single or dual consoles with two or three individual seats abreast. Instead, the Z-7 Sport more resembles a regular sport boat with a full, tall, three-piece, radiused, tempered glass windshield with centre walk-thru, full driver and passenger consoles, driver and passenger adjustable bucket seats, plus a full-width stern bench seat; two single fold-down jump seats flanking a centre fold-down large single or tight double seat. The second thing you should notice about the Z-7 Sport is that it offers an unusually extensive, high end, and most useful complement of standard equipment dedicated to the enjoyment of both serious fishing plus general on-water family enjoyment. After these two items, you will most likely observe that virtually every interior available space is dedicated to general or specific storage of one sort or another. The fully fiberglass molded floor and inner liner of the Z-7 Sport continues forward into the recessed, carpet-covered bow deck with side bolsters and with molded-in and covered port and starboard storage compartments plus a huge in-floor forward transverse storage compartment with dedicated storage for the standard removable ski-tow pylon. A longitudinal in-floor molded-in three-tube rod storage locker is centred within the bow deck. Right at the bow is the raised molded trolling motor platform complete with the standard wireless Minn Kota® PowerDrive™ foot control trolling motor with Universal Sonar transducer. The bow control panel includes an anchor light switch, trim switch and room for an additional depth/fishfinder. The aft deck contains a total of five opening compartments. 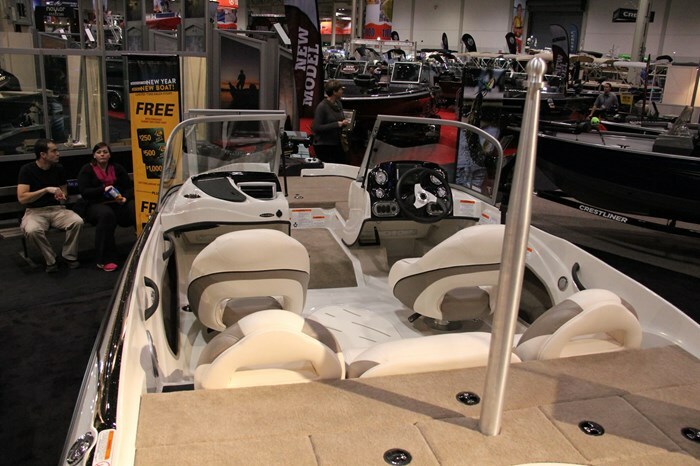 Immediately behind the stern seats is a full-width lockable compartment suitable for more fishing rods or waterskis. Centred behind this is a standard 16-gallon, aerated, recirculating, and rotomolded livewell with rounded corners, timer, and pump-out. 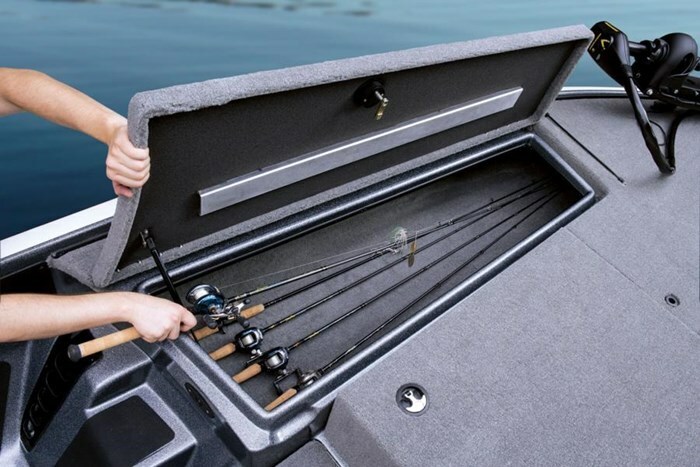 Outboard of this livewell on each side are more storage compartments with drop-in boxes, which, when removed, reveal dedicated battery compartments below. Molded into the transom on each side of the standard choice of a Mercury® 150L Four Stroke or 150L OptiMax® Pro XS is a half swim platform with a recessed telescoping stainless steel 3-step boarding ladder on the starboard side platform. Top speed with either motor is said to be in the mid-fifties mph. 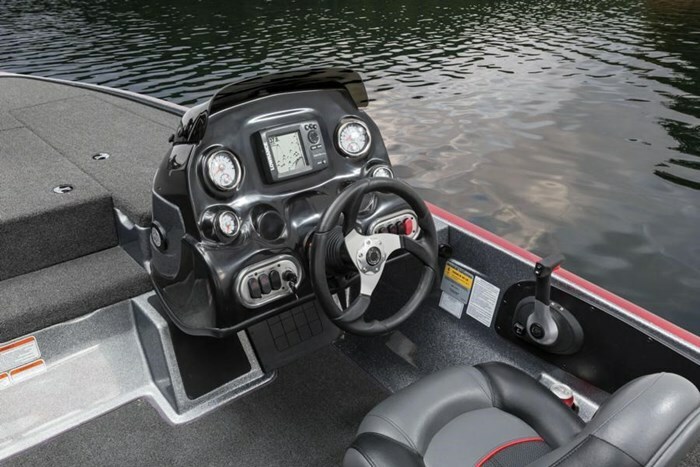 The custom molded driver’s console ahead of the standard tilting hydraulic padded sport steering wheel features a centre flush mounted Lowrance® Mark-5x Pro fishfinder including surface temperature display. On each side of this is one of Nitro’s two new large-size Veethree® multi-function gauges and below each of these, a smaller diameter gauge. A dash light dimmer switch is also standard. The port side console includes an insulated, lockable glovebox ideal as a drink cooler plus the standard AM/FM Bluetooth compatible stereo complete with USB and MP3 ports. An insulated cooler is built into the base of the wider middle cockpit stern seat while the two single stern seats remove to not only provide steps up to the aft deck but also to be utilized in the provided floor-mount bases in both the bow and aft platforms as fishing seats. More storage, ideal for skis or a wakeboard, is found within a large cockpit in-floor compartment plus open storage is provided within both the cockpit port and starboard side coamings. The relatively few notable options for the Z-7 Sport include fishing seats, bow and aft sundeck cushions, snap-in cockpit carpet, battery charger choices, canvas covers, trolling motor upgrade, in-dash Lowrance® or Humminbird® graph upgrades, flush-mounted bow graphs, plus trailer upgrades from the standard supplied custom-fit, factory-matched, single axle NITRO® drive-on trailer with colour-coordinated powder-coat finish.